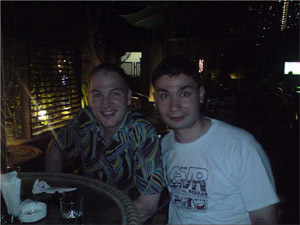 I am very happy that last saturday I met John Wakefield (莊域飛) in Sha Tin. John and his wife were super nice and I learnt a lot about his life, Cantonese and other aspects of life. My wife agreed that John now speaks like a 100% Native Hong Kong person. Pretty happy that I could speak Cantonese with them for a few hours without problems. I was a little ashamed of being so far behind John in Cantonese accent and accuracy, however, it motivated me to do my best and improve on my accent and pronunciation. John explained “fossilization”, where one will reach a point in ability and not improve any further no matter how long one speaks a language. Such as my father who speaks fluent but far from native English, even though living in Australia for 40 years. John pointed out that everyone has their own talent or skill. While I have an impressive vocabulary in Cantonese, John has an impeccable talent for accent accuracy. For those who don’t know who John is, I have listed a few impressive videos of him speakng Cantonese when he was my age. Watched the first video, impressive. I would love one day to get anywhere near that level with any of the languages I am learning (French, Catalan and German).